When the weather starts getting warmer, our mood starts getting a little lighter. The days are longer, the sun is out, and there’s a refreshing feeling in the air. We’re here to give you inspiration and simple ideas on how to take your home from winter to spring. Although spring is a great time to do a huge makeover, sometimes all it takes is a few simple changes to change the look and feel of your home. Firstly, you’ll want to swap your cozy faux fur throws, blankets, and pillows for something more lightweight. Think cotton and linen over chenille and velvet. You can also change your window treatments from heavy drapery to something that will let more light in. You can also swap out your winter accessories for something a little lighter and brighter. Linda says, “My grandmother had a duck collection for the winter and one for the spring. It’s really about what makes you happy in your home.” What reminds you of spring? Plants and fresh flowers? A bowl of fruit on your dining table? Sea glass from your local beach? When it comes to accessories, follow your intuition and be guided by what brings you joy. It’s true that spring and warm weather lends itself to lighter fabrics, but there are really no rules when it comes to transitioning your home season to season. Aside from thinking about the sensory experience in your home, you can really change the feel of your home by making simple and unexpected changes. Move your bed from one side of the room to the other. Scape your bookcase in a new way by stacking some books, putting others sideways, and placing a plant or accessories between books. These changes will hit the reset button and give you a feeling of newness in your home that may just inspire you to make other changes in your life. Springtime as a time to clean and organize is not a new trend. But it’s one that will have a huge impact on your home and wellbeing. Linda says, “If you have a cluttered home, your life is probably cluttered too.” And without doing a major overhaul, there are simple ways to get organized and clean your space. When thinking about transitioning your home to spring, Anne comes back to the term “new life.” Any way that you can bring the outside into your home is going to bring a sense of rejuvenation to your home. Fresh flowers like daffodils and tulips. Hyacinths that grow in water. Airflow! If it’s still too chilly to open your windows, have a fan going. Change your family photos from winter scenes to spring and summer scenes. Speaking of a refresh, our showrooms have just had a makeover. New vignettes and new, exciting pieces are in. 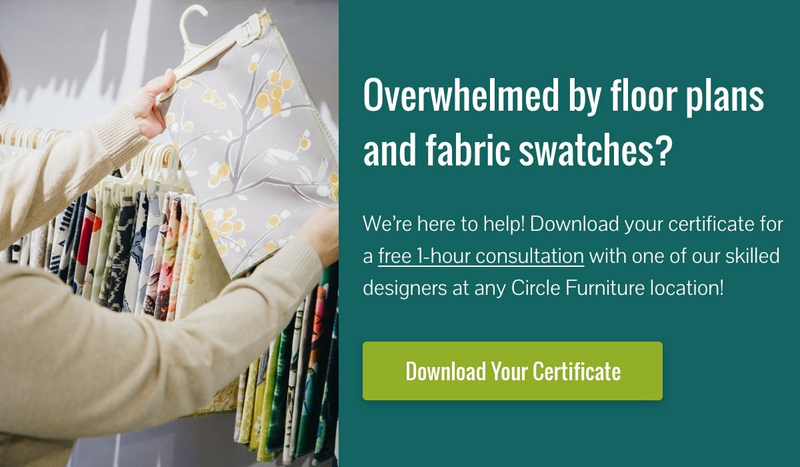 Come take a stroll, get inspired, and chat with a designer to learn how you can transition your décor from winter to spring in a way that makes sense for you.